The Coyotes have missed the playoffs for five straight years, winning just 39 percent of their games (147-179-50) during that span. Their winning percentage is slightly higher than the Buffalo Sabres, who only won 35 percent of their games (133-196-47), but neither is quite as bad as the Harlem Globetrotter’s arch-enemy, the Washington Generals. Despite playing one another hundreds of times per year, the Generals have won only seven times since 1939. At only 28 years old, Chayka is younger than a quarter of the Coyotes’ roster. He’s at least 16 years younger than every other NHL general manager and is 46 years younger than Lou Lamoriello, the league’s oldest general manager. Lamoriello, now with the Toronto Maple Leafs, was a general manager for two years before Chayka was even born. “Johnny is a young whippersnapper. He probably uses the world wide web a lot,” said Lamoriello while sipping his mid-afternoon Ovaltine and prune juice cocktail. The three-time Stanley Cup-winning elder statesman then looked out the window and yelled at several squirrels to get off his lawn. 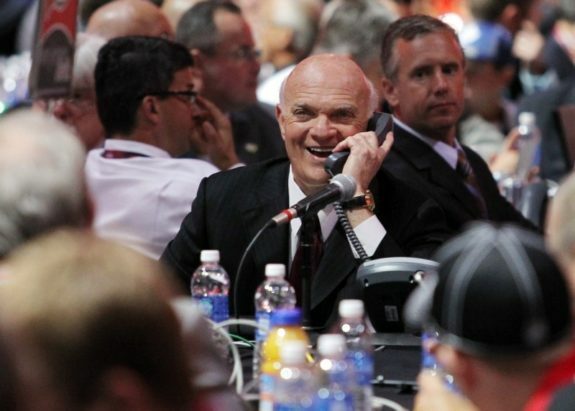 Lamoriello is happy using his Magic 8-Ball instead of today’s new-fangled statistical computing devices. Chayka, the youngest general manager in professional sports history, has “schooled some of my executives just by asking the right questions and getting people thinking about things,” said team co-owner and president Anthony LeBlanc back in October of 2016. While this statement may bode well for the youngster, it also shines a light on the qualifications of “executives” LeBlanc has running his prized possession. LeBlanc, president of Arizona Coyotes, and Gary Drummond, president of hockey operations, both stepped down from their duties in June 2017. The moves, according to Chayka, were necessary as they weren’t fluent in Snapchat and Instagram platforms, and were inept at playing flip cup or using a fidget spinner. Before joining the Coyotes’ organization, Chayka ran a company called Stathletes Inc. that specialized in using advanced statistical analysis to evaluate player performances. His business developed processes to improve performance levels through nutrition, science and training methods. Many league executives, coaches, and players had raised eyebrows when he ascended to the position of general manager after just 11 months on the job with the Coyotes. “Yeah, all my spreadsheets predicted it would stun the league,” said Chayka while playing with a calculator and writing “BOOBLESS” upside-down using the numbers 55378008. His data also suggested that Chayka himself would be the heir apparent to Gary Bettman and that Jaromir Jagr should be able to play five more decades. In Chayka’s first year as a general manager, the team actually regressed nine points, finishing in 10th place in the Western Conference and 28th overall in the standings, with 70 points. 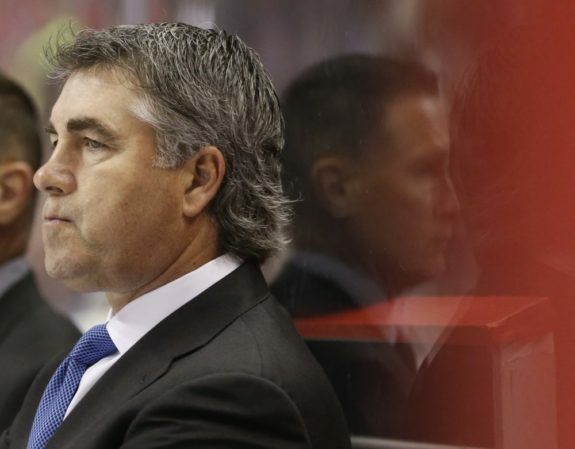 Longtime Coyote head coach Dave Tippett quit the team recently. 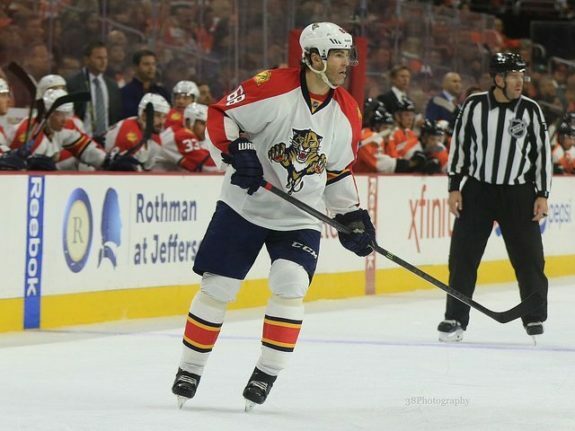 He made the move after majority owner Andrew Barroway revealed Shane Doan, the team’s captain since 1923 and an original member of the franchise from its days in Winnipeg, was not being brought back. “Other than the ownership, the instability of the team, the sorely lacking arena, and the pervasive losing culture, it was a great experience,” said Dave Tippet, who basically fired his team. 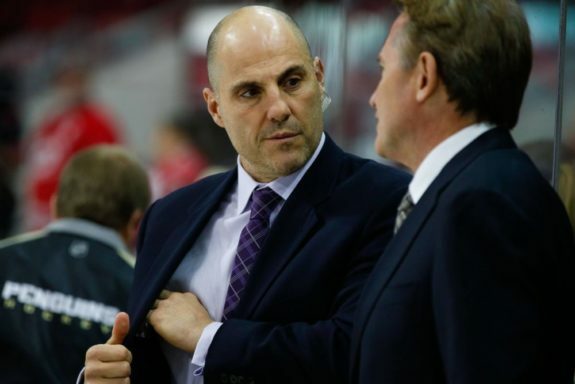 Rick Tocchet, a former Penguins assistant coach, was hired to replace him earlier this week. Tocchet played for the franchise for three years and previously served as an assistant coach with the Coyotes during the 2005-06 season under coach Wayne Gretzky. He’s excited about his new opportunity. “I can’t wait to get started,” said Tocchet. “This franchise is in such disarray that things can only get better.” He then put on Howard Jones’ 1980 hit of the same name and began a spasmodic, gyrating dance. Chayka is determined to improve the team and hoist Lord Stanley’s Cup. A press release on the Coyotes’ Facebook page said they are honored to have Tocchet leading the charge. “Based on my statistical regression analysis, Rick’s a guy that can come in here and make a difference,” said a beaming Chayka. The harsh reality is more like he’s destined to lead this team from ineptitude to complete irrelevance. 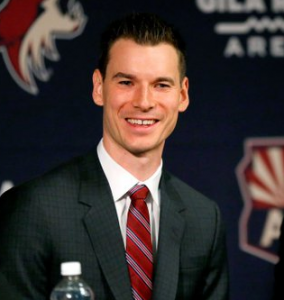 Chayka is a highly aggressive trader, having added Alex Goligoski on defense and having brought in free agents Jamie McGinn and Radim Vrbata last year. This offseason, Chayka has continued tweaking the Coyotes’ roster. He’s signed defenseman Adam Clendening to a one-year deal and forward Nick Cousins to a two-year deal after acquiring Cousins in a trade with the Flyers. 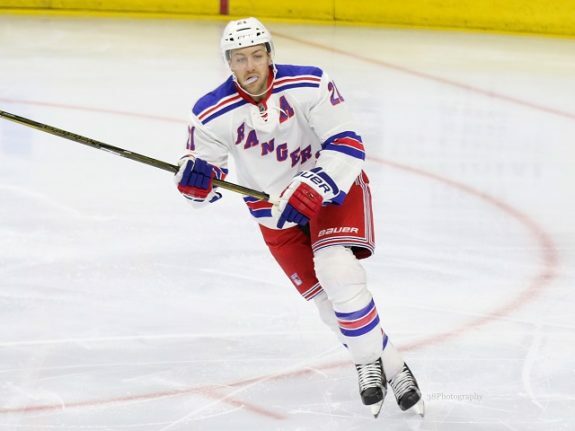 Other acquisitions include forwards Derek Stepan, Zac Rinaldo, Michael Sislo, Michael Latta, and Emerson Etem. On defense, Andrew Campbell, Joel Hanley have signed contracts. A few players still in negotiation include two-time Lebanese League MVP Bashir Nassar Haddad, who has just learned to skate backwards, Irving Finklestein, a power-play specialist from the Hebrew Yarmulkes, and Enrique “El Taco” de Jesus Hernandez, who was an All-Star goalie from the Mid-Mexican Puebla League. According to Chayka’s numerical data, they all have statistical upside. No one really thought losing Brad Richardson to a broken leg early in the season would be the first domino for the desert dogs’ demise. With several new faces in the lineup, improvement is on the distant horizon. Though difficult to watch for several seasons, Chayka believes the Coyotes’ future has never been brighter. Then again, that’s like comparing a 10-watt light bulb to an 8-watt light bulb. 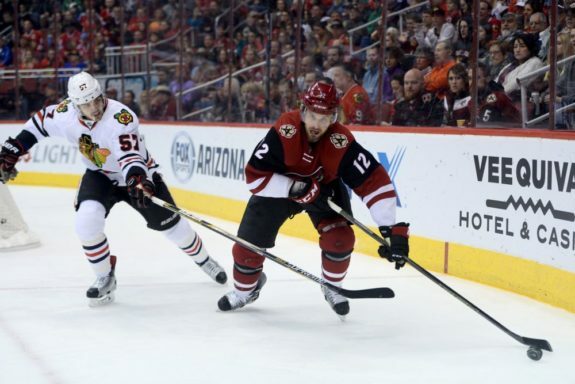 The proof of the Coyotes’ success this season will be in the data; statistics don’t lie. “We’re not robots. The data is just there as a tool in the decision-making process, process, process, process…,” said Chayka before short circuiting with steam coming from his ears and face planting into a granite table.